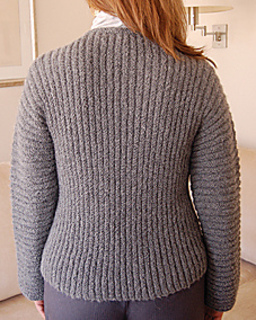 This one piece, double-fronted jacket is worked sideways from cuff to cuff in Stocking stitch and reverse Stocking stitch ridges. 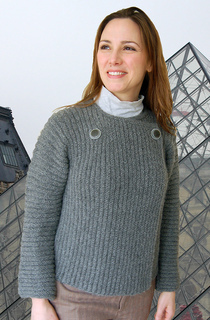 It closes with two buttons, at left and right of neck opening, and the vertical ribs expand to fit over shoulders and hips. When unbuttoned, jacket fronts drape with a wide lower collar for a completely different look, see additional photos. or Long (low hip): 26 – 28” (66 – 71cm).